Saturday afternoon, in East Central Texas, a familiar face will once again be toeing the rubber in a professional baseball game. Not in a game that really matters, mind you -- and certainly not in a game with any playoff implications. This will be in an independent Atlantic League game for the Sugar Land Skeeters. A game that otherwise wouldn't warrant a second look outside the city limits of Sugar Land, TX. But this isn't just any familiar face. This is the one-time pride of Houston...and Boston...and Toronto...and New York -- Roger Clemens. I say the one-time pride because by now most people have long since washed their hands of the guy. Embroiled in the middle of the steroid controversy of the past several years, Clemens was recently acquitted of lying under oath about his involvement with performance enhancing drugs. Now 50, Clemens claims this start on Saturday is all just for fun. A way to show his sons that ol' dad still has what it takes to pitch at a professional level. 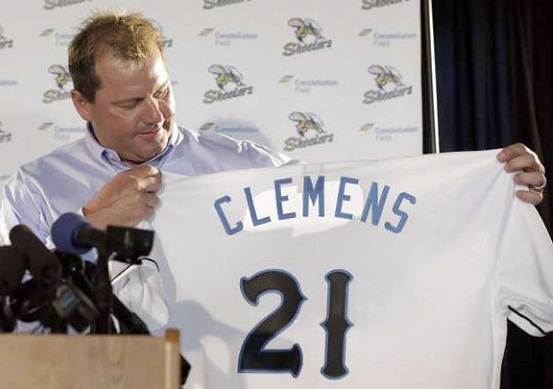 No, I don't think Clemens has any intention of throwing for the Houston Astros or the Texas Rangers, or even his beloved New York Yankees again. And I don't think he's doing it for fun, or to show his kids he can, or even because he can't say goodbye to the sport he loves. I think this is Clemens' way of thumbing his nose at all those people who have accused him of using steroids over the years. Never mind that his acquittal earlier in the summer did nothing to disprove his alleged use of PEDs. For him, that verdict was vindication, and this start on Saturday is basically Clemens giving all his detractors a gigantic middle-finger salute before walking off into the sunset. I don't think it matters one iota to him if he pitches a 2-hit shutout, or only goes 3 innings and gives up 5 runs. The simple fact that he can get someone to let him pitch at his age, with all the accusations flying around, is vindication enough for him. Did I mention that he has a gigantic ego? I could be wrong. He may truly have aspirations of a major league comeback. But if what he is saying is accurate, that he is only hitting 84-87 mph on his fastball, I have news for him -- I haven't swung a bat in over 25 years, and I'm 50 myself, and I guarantee I can still turn around an 85 mph pitch. This guy is an egomaniac if there ever was one. He needs to crawl back under his rock and stay there. hes a douchebag. hope his arm falls off.